In September 2016, the Institute for Global Engagement (IGE) expanded its religion and rule of law training programs at the national and provincial levels. IGE, in partnership with the Vietnam National University’s University of Social Sciences and Humanities- Hanoi, Vietnam-USA Society, and Brigham Young University’s International Center for Law and Religion Studies, conducted the 8th “International Conference on Religion & Rule of Law (R&ROL)” from 15-16 September in Hanoi and the fifth R&ROL Certificate Training program in the Northwest Highlands province of Lao Cai from 19-23 September. The programs equip local government and religious leaders to make the case from within their own cultural context that religious freedom is essential for a stable and prosperous society. The two-day R&ROL conference focused on the development of R&ROL in Vietnam and the ASEAN community. Participants at the conference included faith leaders, researchers, policy advisors, government officials working on religious affairs, professors, as well as Masters and Ph.D. students. Scholars and experts from Southeast Asia, the United States shared best practices and research about international relations and religious freedom and how religious communities contribute to security and societal flourishing in ASEAN. Topics focused on the principles for constructing a rule of law on religion in Vietnam and ASEAN and how religion is a positive resource for society and how governments can maximize the contributions from faith communities. 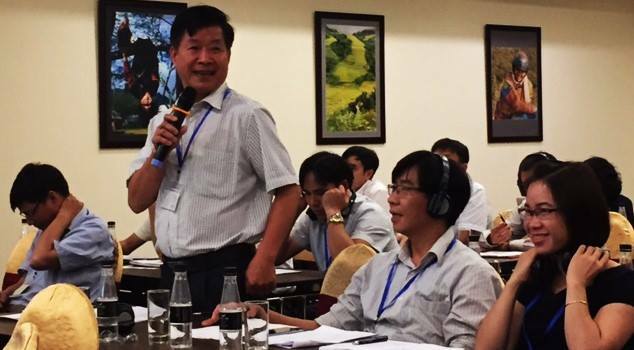 The conference took place during a critical time as Vietnam finalizes their draft law on religion this fall. Participants were able to debate several controversial articles and discuss how laws and regulations can make accommodations for religious communities and contribute to greater religious freedom and civil society. The National Assembly has appraised the draft law based on feedback and recommendations from Vietnamese citizens and experts on religion and rule of law. The draft is currently being revised and will be presented to National Assembly members who will a vote on the draft law in the upcoming October-November session. Following the conference, IGE and its partners traveled to the Northwest Highlands province of Lao Cai to conduct the first certificate program held at the provincial and district levels. The program trained 61 participants from 14 provinces. Participants included government officials working on religious affairs and faith leaders from neighboring provinces in the Northwest Highlands region. The program equipped participants with basic concepts of religion and rule of law and raised awareness on international standards on human rights, religious freedom, and the need for authorities at all levels to protect the human rights of their Vietnamese citizens. Participants also had the opportunity to share practical experiences and challenges as they implement policies on religion at the local level. Participants and facilitators conversed about complex issues such as religious and ethnic minorities, religious registration, and Vietnam’s draft law on religion. This year’s R&ROL programs are the result of IGE’s deepening work in this field in Vietnam over the last decade. Four certificate programs at central level were conducted in Hanoi (twice), Ho Chi Minh City, and Da Nang from 2012-2015. IGE and its country partners will conduct future R&ROL certificate programs in rural provinces. Three alumni from previous R&ROL programs made presentations at the conference and certificate program this year, sharing their knowledge and expertise on R&ROL. Scholarship and a network of like-minded reformers are expanding throughout Vietnam, and as a result, religious freedom and religion and rule of law are becoming regular topics of study and practice at academic and government institutions; all of which did not exist five years ago. Please see our photo blog to view additional photos from the R&ROL training programs. About the Institute for Global Engagement – The Institute for Global Engagement works at the critical intersection of religion and global affairs, building sustainable environments for religious freedom worldwide. Through local partnerships, IGE works transparently to convene, connect, and build consensus among government, religious leaders, and scholars to ensure that people of all faiths and none have full freedom of conscience and can participate as equal citizens in public life. To learn more about IGE’s work in Vietnam, please contact Hien Vu at hvu@globalengage.org.